Early this morning my buddy Ed and I were on the way to Deme Acres Golf Course. 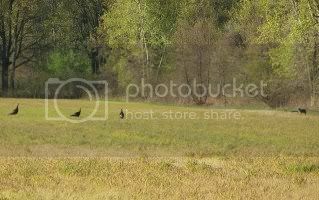 We were almost there when I said “I can’t believe we haven’t seen any turkeys around here this year!” Almost immediately we spotted these three jakes, and a hen that was near the fence row. As I got my camera set for a picture, a coyote appeared from the thick tree-lined fence-row. I was able to snap several pictures, and I have one that shows the three jakes warily keeping an eye on the coyote. 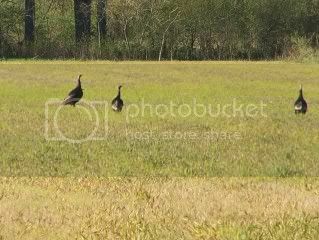 We had a car coming up behind us, so I had to move on, but I think I may know why we’re not seeing many turkeys in this area. Just last week I went to pick up a pizza, and ran into an old neighborhood buddy. Rod Millhouse was a couple years behind me in school, but my best friend Mickey Hunten used to live next door to the Millhouses, so I saw Rodney and his family a lot. In fact an old school chum (Charlie Marlow) married Rod’s sister Sharon. Rod’s mom and dad used to do a lot of square dancing, and would have the neighborhood kids come over for some “square” fun! Anyway every now and then my family would run into Rod, his dad George, and Charlie while deer hunting in Lewiston. We’d always put on a few drives, and Rod and I reminisced about some of those times while waiting for our pizza. I asked how his parents were doing, and he said George was out in the car. He’s in his 90’s, but his mind is clear, and he remembered many of the details about our deer hunts from long ago. George just hung up his gun and bow a few years ago, and the picture above is of one of the nice bucks he took with his bow. 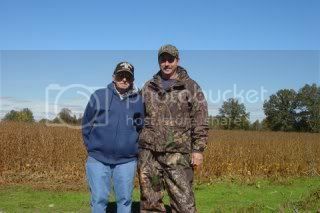 Rod explained how they moved their hunting operation down state, as Rod’s friend (Glenn Hotchkiss) kept shooting huge corn feed bucks, and it was only an hour and a half drive from home. A couple years ago George took his last deer, which happened to be a big doe. George was so excited about it that he took off running through the cut cornfield where it laid. By the time he got to the deer George had fallen down three times, but the grin on his face said it didn’t matter. Man I hope I can keep that vigor and excitement, for the hunt, as long as George did. In fact I hope I can just walk in my mid-eighties, let alone run. I wanna be like George! Good seeing you guys. God bless and keep you always. 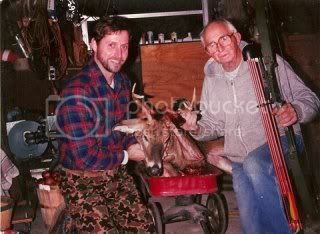 Rod and George deer hunting Southern Michigan. After reading Arts post at “Simply Outdoors” about his daughter catching her first fish I started thinking how important that first catch is. I mean it might not be the most stupendous thing to ever happen to a kid, but it just could rank way up at the top of the list. Especially if the child is somewhat older, and has never caught a fish before. That’s my grandson Keegan (Bubbie) McNamara fishing 16 mile lake in the U.P. His dad isn’t an outdoors person, so the only opportunity Keegan gets to fish is when were on family vacation. He can tell you all about the first fish he ever caught, and he’ll go at it for hours, even when their not biting. 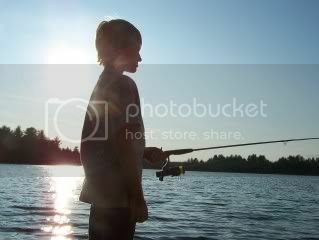 All my kids started fishing as soon as they knew how to turn a fishing reel handle. Most of the grandkids have be initiated, and they all love to fish for sunfish, bluegill, and the occasional bass. Bubbie and his sister Nadia both caught bass last summer in a little lake just outside of Manistee. My family not only loves to catch fish we love to eat them as well. Just two days ago I fixed a mess of Lake Erie perch. I’m really looking forward to this summer, and fishing with the grandkids. Now if only Art will show me how he got his little girl to kiss that fish I’ll be all set for a Kodak Moment. 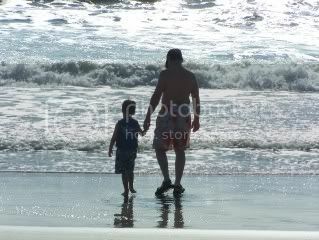 Grandson Kyle and son-in-law Glen at the ocean in Cocoa Beach Florida. We were only there for a day, but we had a blast playing in the huge waves. In fact there was a surfing contest going on that Sunday. A couple of times the waves literally knocked us off our feet. Ah, but that is not what this blog is all about. It’s about our first day in Orlando as we enjoyed our condo-side pool. It was a zero entry pool so the little guys could start off nice and shallow, and it gradually went to 5 feet on the deep end. Around 1:00 o’clock Monday afternoon I was playing catch with Kyle in the pool. Two little brothers were playing with us for awhile. One was 5 years old and the other 2-1/2 years old. They got tired of playing with us, and wondered off to play elsewhere. My take on that is “Hey your the mother, you should of made him wear a life jacket or floaties!” If you notice Kyle has his life-jacket on in the picture, and always had it on in the pool. Another point of interest is that there were at least 40 people in the pool when this happened, and one guy was only 4 feet away from a drowning child. Don’t count on others watching your kids when their in the water. Most people are preoccupied with their own activities, and a tragedy could happen right next to them and they wouldn’t know it. Summer is just around the corner. Pools and swimming are great fun, but can also be very dangerous, especially when little ones are around water. Be diligent, and never let your guard down when planning water activities. Teach your kids to swim as early as you can, and make them wear some sort of flotation when enjoying summer fun. An ounce of prevention is worth a pound of cure! One of the white pines in my back yard died over the winter, so I decided today was a good day to cut it down. I borrowed my son-in-law’s chain saw, and went to work. I had to drop it in my neighbors yard, as a power line prevented me from dropping it in my yard. After trimming several lower limbs I started on the trunk. A robin was making an awful fuss, but I saw no nest in the dead tree. 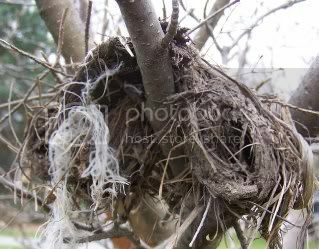 I figured she had one in the live pine north of this one, and that I was desturbing her nest making. Once I got the pine on the ground I saw she did have a nest high up in the branches. She screeched and squawked like she was really mad, and I guess she was. Oh well there were plenty of other trees to build another nest in. My son-in-law (Tony) was power washing my deck, and I was planning on cooking us a couple elk steaks on the grill. I wrapped them in foil after seasoning them and sliced some onion to go with it. I put some tatter-tots in the oven and sat back to wait for a hot juicy steak. Tony had to leave for a Dr. appointment, so I took his off the grill first, and got him set to eat. I retrieved a plate for myself, and returned to the grill for mine. I opened the tin foil to reveal a very nice looking elk steak and onions. I picked up the tin foil and slide it onto my plate. At that very instant a big glob of bird crap splattered on the plate getting me, and my steak. I looked up to see a robin looking down, as if to say “How do you like me now?” I know it seems too coincidental, but I couldn’t help thinking about a mother robins revenge. Its a good thing I had put a third steak on the grill, cause I had opened a package of three. I played it safe and didn’t take that one out of the tin foil. Mrs. Robin might of rained on one parade, but she wasn’t getting double the revenge. I sat in the garage and enjoyed the fruit of my labors, minus the extra seasoning! This 6-7 foot alligator was patrolling the waters of the little lake we were bass fishing in while in Florida. This is not the only one we saw in this lake, surrounded by houses on about half the shore line. While trolling offshore from one such house, the family pet came out into the water to play and get a drink. We assume the owners let him out to go to the bathroom, as we saw no humans in sight. 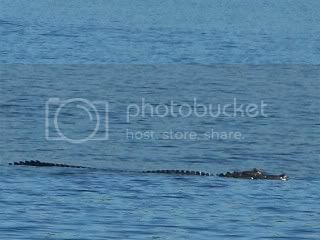 The gator was about 75 yards of shore keenly watching “Fido” swimming in enemy territory! Our guide, Captain Reno, said the gator would probably ambush this dog, if he kept to his schedule of early morning swimming. He said he wouldn’t be surprised if the dogs owners were soon running an add in the newspaper reporting a missing dog! The gator would first get a good hold on the animal, then pull it out into deep water and drowned it. After that he would dine at his leisure. The Florida Fish and Wildlife Division will not even mess with a gator this size. 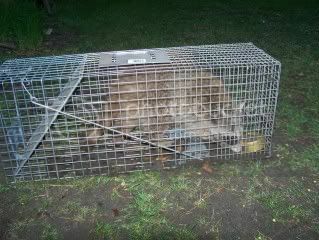 They usually have to be larger for them to get involved in trapping and relocating them. Therefore a 6-foot gator has it made when it comes to the dogs, cats, ducks, geese, cranes, and a multitude of other lake dwelling critters at his disposal. Truthfully I wouldn’t want any little kids near one of these opportunistic prehistoric reptiles. If you have a body of water, it’s a good bet there’s an alligator close by. Some of the golf courses even have alligator warning signs for your safety. Oh well, it was a cool experience seeing these wild reptiles in their native habitat. I’m sure they were there long before Mr. and Mrs. Fido set up shop, and will probably remain long after the dogs are invited to dinner! I don’t know if I’ll get this posted or not! We were on the road 14 hours yesterday and 10 hours today, and I am tired. The traffic was the worst I’ve ever been in, and this may of cured me from ever driving to Florida again. The picture is me and my grandson Kyle with the biggest fish of the day. I caught a few others that were smaller, but this one was a blast to reel in. A fish this size can really put up a fight, and fight he did. No wonder there are 1500 bass fishing shows on t.v. I missed a couple others, that should of been hooked, and so did Glen. We opted to try our hand at bigger fish this year, rather than going after quantity, we went for quality. Last year we landed 23 fish, but the biggest was only about 4 pounds. This fish went between 6-7 pounds and felt like a 10 pounder when I reeled him in. Again we used Captain Reno Alley from “Memory Making Guide Service,” and greatly enjoyed out time on the water with him. 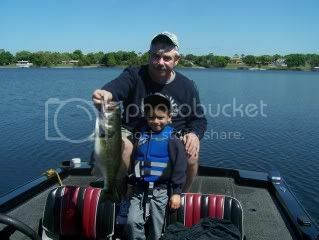 Jan-April is the best time to fish for bass, and if your in the Orlando area give Captain Reno a call at 1-800-749-2278. All you need is your 3-day Florida fishing license. Captain Reno supplies the rest, including drinks and snacks for your time on the water. Nice boat, great personality, and knowledge of the local lakes will put you on fish. Ok I’m headed for the shower, and then to my nice warm bed. Sorry about the absence of any post during the last week and a half. We are on our way back from Florida, and I finally found a place with internet service so I could let readers know whats going on. That’s if I still have any readers. It’s been a long 10 days, but it definitely flew by. When I get back and can post some pictures I will. Caught a nice 7-8 pound bass on our fishing trip, and got to see a couple alligators on the water. The weather was beautiful (the 80’s) the whole time we were there. I saw where Marquette had gotten a foot of snow, and it made us all cringe. Looks like were coming home to much cooler temps, but hope we get to at least see the sun. This is a long drive, and the traffic was awful! Construction along I-75 was bad in Tenn. and especially Georgia. Many delays and traffic backups. We’ll the gang is calling for me,so we have to hit the road again. Be back in Monroe this evening.